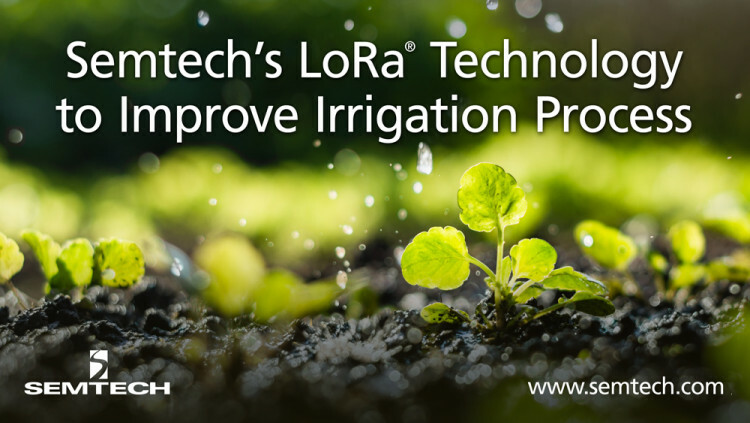 CAMARILLO, Calif., Feb. 13, 2018 – Semtech Corporation (Nasdaq: SMTC), a leading supplier of high performance analog and mixed-signal semiconductors and advanced algorithms, announced that WaterBit, a venture backed precision agriculture irrigation company and National Science Foundation (NSF) grant winner, has incorporated Semtech’s LoRa® devices and wireless radio frequency technology (LoRa Technology) into its Autonomous Irrigation Solution (AIS). WaterBit provides irrigation automation for growers based on analysis of granular, ground-truth data collected through the WaterBit system, including line pressure and flow, soil moisture and temperature and more. With WaterBit’s AIS, growers maximize yield across soil types, while optimizing the use of labor and other input resources. The complete solution is used across a wide variety of crops including grapes, berries, tree nuts, cotton, corn, and leafy greens. Learn how LoRa Technology enables IoT, visit Semtech’s LoRa site. The LoRa Catalog showcases the products you need for building your ideal IoT application. WaterBit, based in San Jose, is a precision irrigation company that believes in helping growers be good stewards of the land through smart agriculture. WaterBit designs innovative agriculture solutions that set the standard for quality, reliability, ease of use and total cost of ownership. WaterBit’s Autonomous Irrigation Solution (AIS) enables microblock control of local irrigation taking into account plant stage, soil conditions and weather at a level of granularity and accuracy that is not possible with other current methods. WaterBit translates technology into tangible value for growers to improve yields, optimize water usage and implement labor-saving strategies. For more information, visit www.waterbit.com/.